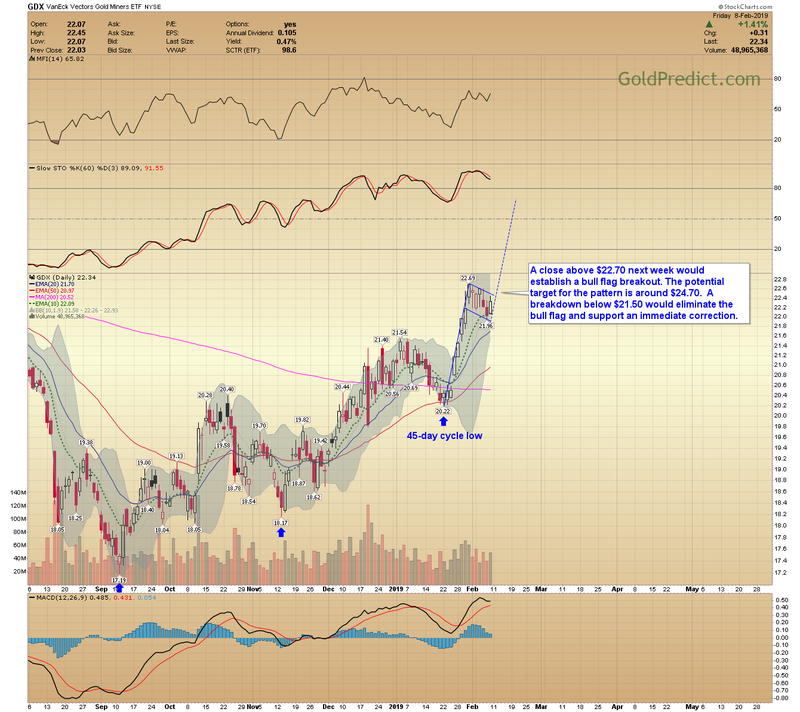 After some deliberation, I altered my short-term outlook for precious metals and miners last week. 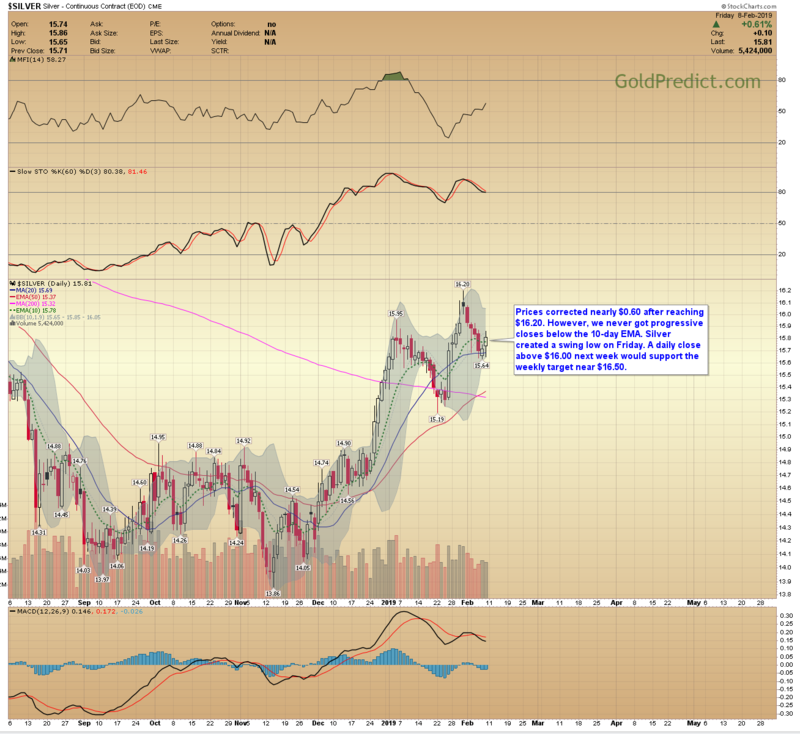 The rally out of the 45-day cycle low in miners was troubling me. The 5 to 7-day thrust was robust and on expanding volume. It’s rare for a move like that to terminate abruptly; there is almost always a higher high. Around Wednesday, I began to see the potential for a budding bull flag, that’s when I felt we might see extended highs into February. Consequently, As long as gold maintains support between $1300 and $1310, a retest of the $1360 level seems likely before this cycle finally corrects. Is a significant breakout above $1400 possible at this time? Probably not – mainly because the intermediate cycle is already on borrowed time at 25-weeks. Of course, a political event or a breakdown in trade talks with China could change things in an instant. Nevertheless, I think the odds favor a little more upside in precious metals before the next multi-week pullback into a 6-month low. 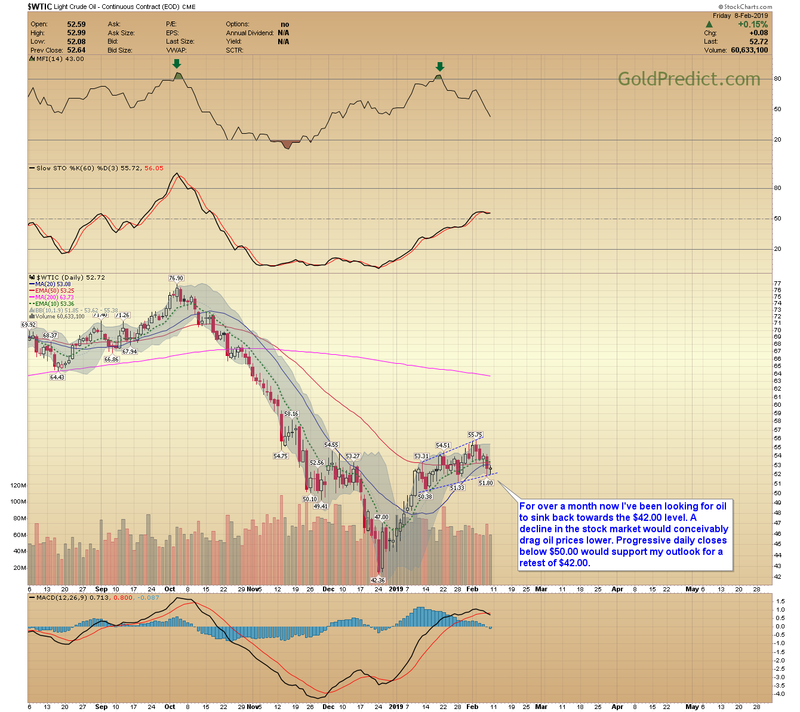 A rally in gold to $1360 in February may correspond with a decline in the stock market and oil. The price action early next week should shed some light. 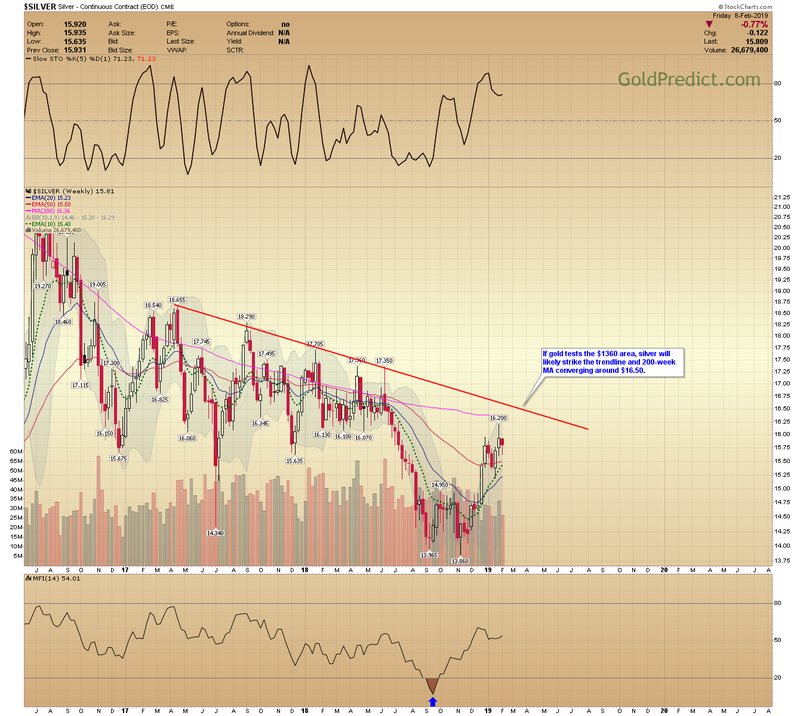 -GOLD WEEKLY- Since bottoming in late 2015, gold has tested the $1360 level to $1375 territory on three different occasions. Prices are once again within striking distance, and as long as gold persists above $1310, another assault on $1360 remains likely. Unfortunately, at 25-weeks this cycle is quite mature, so it probably doesn’t have the stamina to breakout above $1380 – $1400 at this time. In my opinion, the odds favor a top around $1365 (+/- $10.00) in the coming days/weeks followed by a 6-month low in March or April. -GOLD DAILY- Prices formed a swing low on Friday after Thursday’s dip to $1306.40. 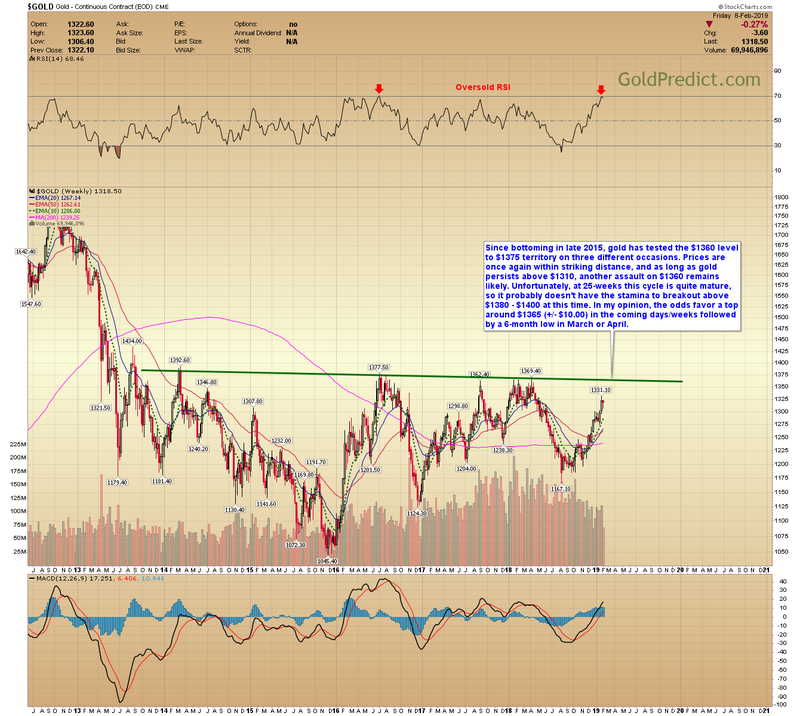 To confirm the potential bull flag, gold has to close above $1331.10. If established, the patterns objective would be approximately $1365. For this to transpire, we need to see some significant upside follow-through early next week. Closing below Thursday’s low ($1306.40) would nullify the bullish flag pattern. -SILVER WEEKLY- If gold tests the $1360 area, silver will likely strike the trendline and 200-week MA converging around $16.50. SILVER DAILY- Prices corrected nearly $0.60 after reaching $16.20. However, we never got progressive closes below the 10-day EMA. Silver created a swing low on Friday. A daily close above $16.00 next week would support the weekly target near $16.50. -GDX- A close above $22.70 next week would establish a bull flag breakout. The potential target for the pattern is around $24.70. A breakdown below $21.50 would eliminate the bull flag and support an immediate correction. 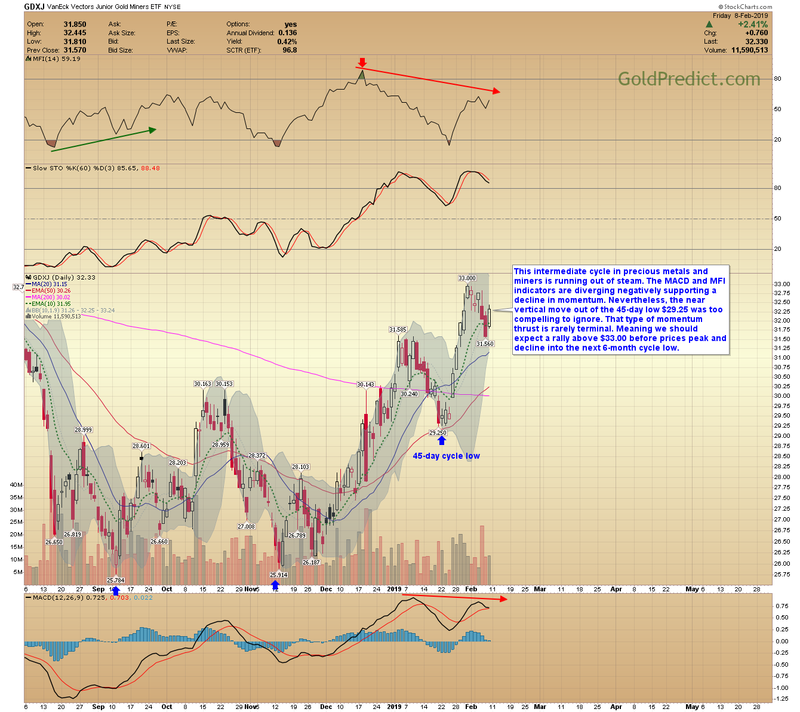 -GDXJ- This intermediate cycle in precious metals and miners is running out of steam. The MACD and MFI indicators are diverging negatively supporting a decline in momentum. Nevertheless, the near vertical move out of the 45-day low $29.25 was too compelling to ignore. That type of momentum thrust is rarely terminal. Meaning we should expect a rally above $33.00 before prices peak and decline into the next 6-month cycle low. 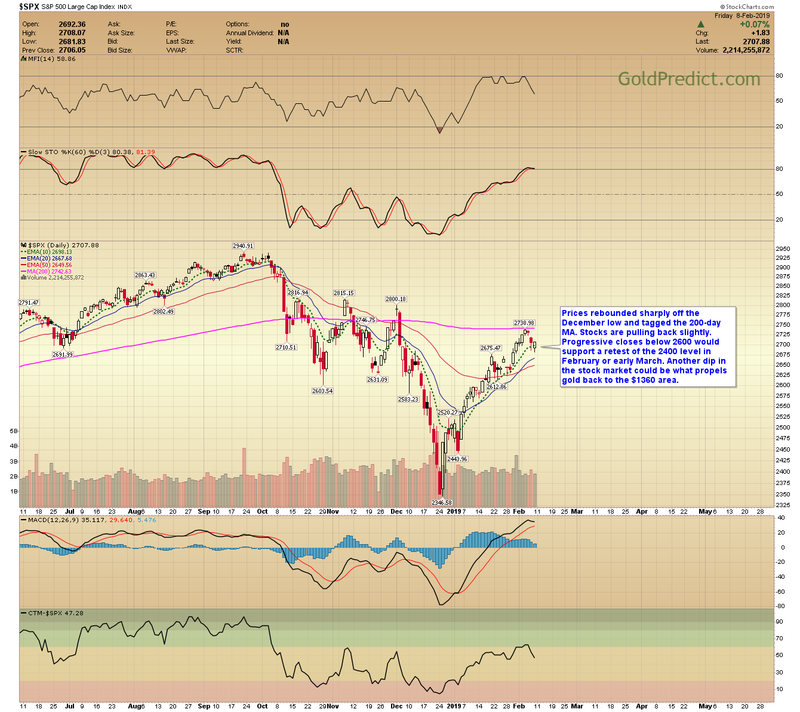 -S&P 500- Prices rebounded sharply off the December low and tagged the 200-day MA. Stocks are pulling back slightly. Progressive closes below 2600 would support a retest of the 2400 level in February or early March. 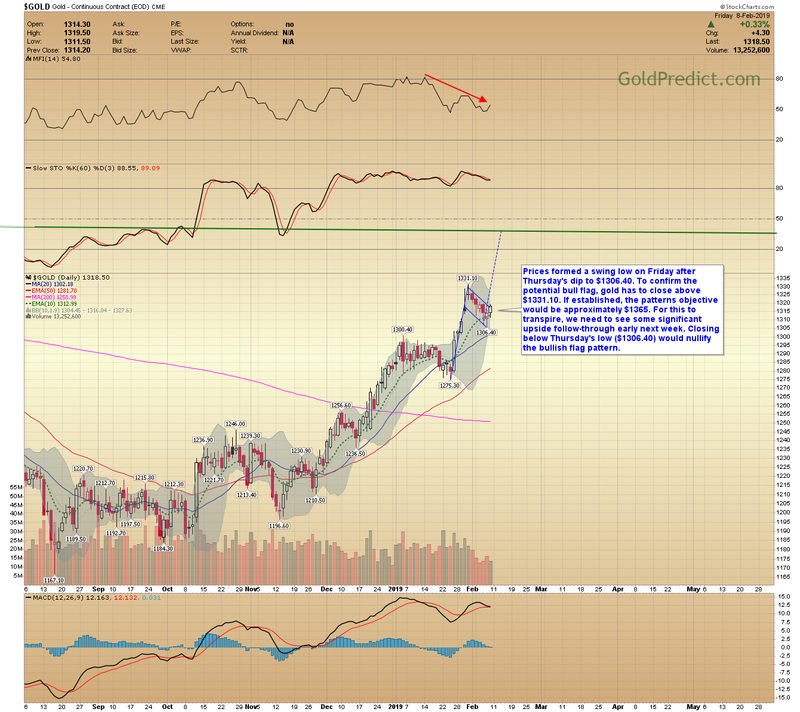 Another dip in the stock market could be what propels gold back to the $1360 area. -WTIC DAILY- For over a month now I’ve been looking for oil to sink back towards the $42.00 level. A decline in the stock market would conceivably drag oil prices lower. Progressive daily closes below $50.00 would support my outlook for a retest of $42.00.